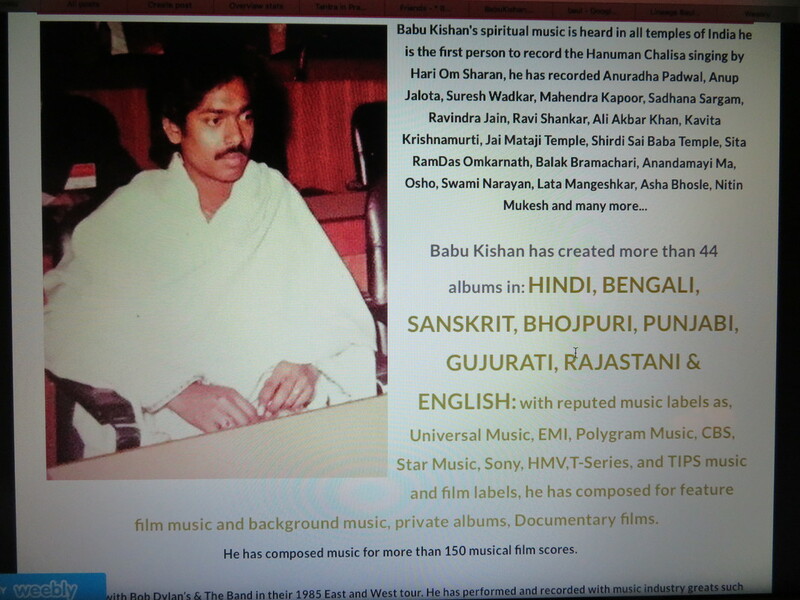 Krishnendu Das aka Babu Kishan is an expert in the Folk Music of Bengal and India. He was a Music consultant during the 1980's for CBS India and Manager A&R, he was specifically hired to categorize all of India's Folk and Classical Music because he is an expert Master of Indian Music. Babu Kishan is a Master of Indian Folk and Indian Classical as a Music Composer and Master of Indian Music he has personally produced Indian Music since the 1970's. He has produced 60 albums and 150 Indian Musical Scores. Bauls are India wandering spiritual minstrels, spiritual messenger and teachers originating from Ekachakra Bengal India whose ecstatic songs and dance reflect their joy, love and longing for mystical union with the Divine. To them the human body is the holiest of holies wherein the Divine is intimately enshrined as the "Moner Manush",the person of the heart. Baul philosophy emphasises love for all human beings as the path leading to the Divine Love. Romantic love to the Baul is the link between the human being and God. In fact, they believe that God is the eternal lover of the eternal woman which is the human soul. 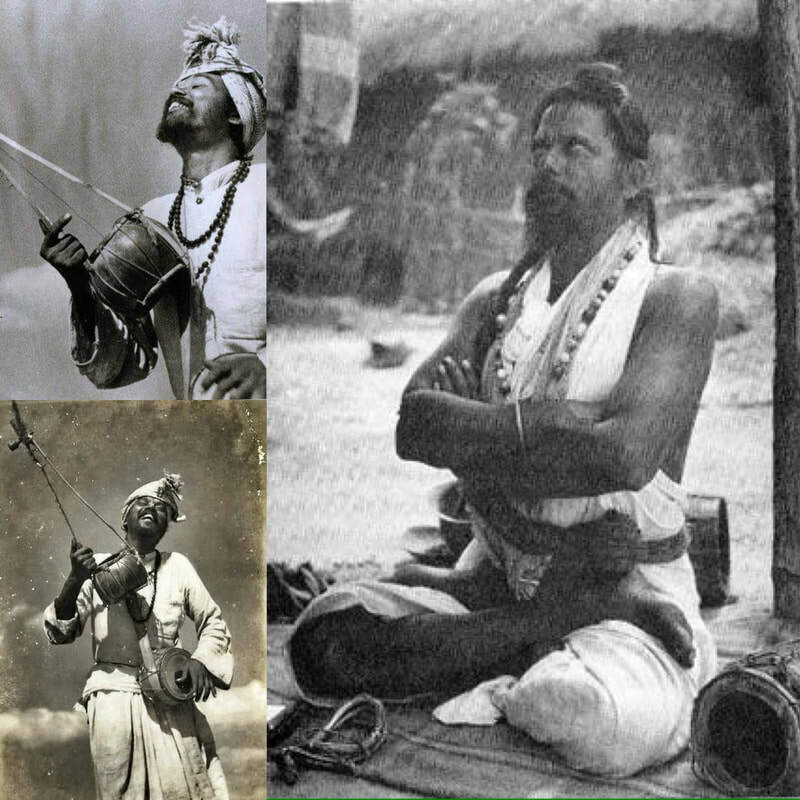 The word "Baul" is derived from the Sanskrit word "Baul" which means Vayu Tula, they are wind catchers thus masters in Nada Yoga and Vayu Dharma, they are only Mad to the Divine not mad crazy. 3. EKTARA - literally "one string". This one string drone instrument is used to accompany singers into the folk traditions of many regions of India. In addition to plucking the strings, the skin head is also struck like a drum to provide rhythm accompaniment. 4. GUNGAROO - these ankle bells add to the orchestration as a singer plucks and beats his ektar, creating a kind of one-man-band effect. Classical dancers use a much heavier set of gungaroos with many more bells to create startling rhythmic counterpoints to the slapping of their feet against the floor. 5. DOTARA - a folk instrument much like its classical cousin, the sarode, and not unlike its western relative, the fretless banjo. Plucked with a coconut shell pick, the strings are depressed with the fingernails of the left hand, rather than the finger pads as in a guitar or violin. the finger nail becomes like the slide on a slide guitar. My Dotar has an electric pickup built into the bridge, which is normally made of elephant teeth, I am the first Baul to do fusion music, then I made an electric mandolin, and added more instruments. Radharani Dasi was the first official Baul to record for all India Radio. In 1960's there was movied call Raikamal made about Radharani's life, wrote by one of Bengali's top writers, Tara Shankar. In 1985 a movie called Togori was also made about Radharani's life.. A very historic family Lineage of Bauls.... Gopal Das was the son of the Ekachakra Nityananda Temple, and he was a great sweet maker. Nityananda Mahaprabu was a Baul and from this lineage." 7. HARMONIUM - portable pump organ, introduced to India by the missionaries, this little reed organ has become one of India's most popular instruments, perfect for 2 finger typists like myself - the left hand pumps the bellows while the right hand plays the keys. Babu Kishan's mother Manju Das Baul introduced the Harmonium as a Baul instrument, she played the Harmonium all over the world during her 0ver 50 years of traveling the world with her husband Purna Das Baul and her son Babukishan Das Baul. They played at places in London like the Royal Albert Hall, South Hall, Hyde Park, Carnegie Hall in New York. 12. GOPI CHAND Yantra- this one string instrument allows you to change the pitch by squeezing the bamboo sides. The tighter you squeeze, the lower the note gets, until the instrument breaks and you have to get a new one at the corner gopi chand store. The name Gopi Chand came from Babu's lineage, The Vaishnava Lineage Bauls of Bengal. 13. DHOLAK - 2 headed barrel shaped drum popular in all sorts of Indian folk music. and mixture of rural life and any of the above. 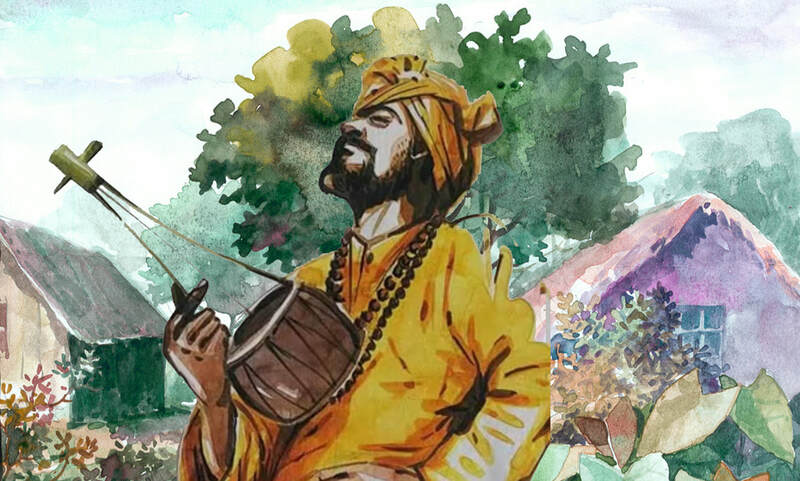 The Vaishnava Baul tradition is a unique heritage of Bengali folk music, it originates from 'Ekachakra Birbhum Bengal' and was brought to the world by our pioneering one and only Lineage of Bauls some 60 years ago. Baul is now extinct it is an oral and intangible heritage of the World. Today many have used Baul fundraising for their own cause. The stories have been twisted, watered down, reduced and dumbed down, Baul has been Culturally Appropriated. 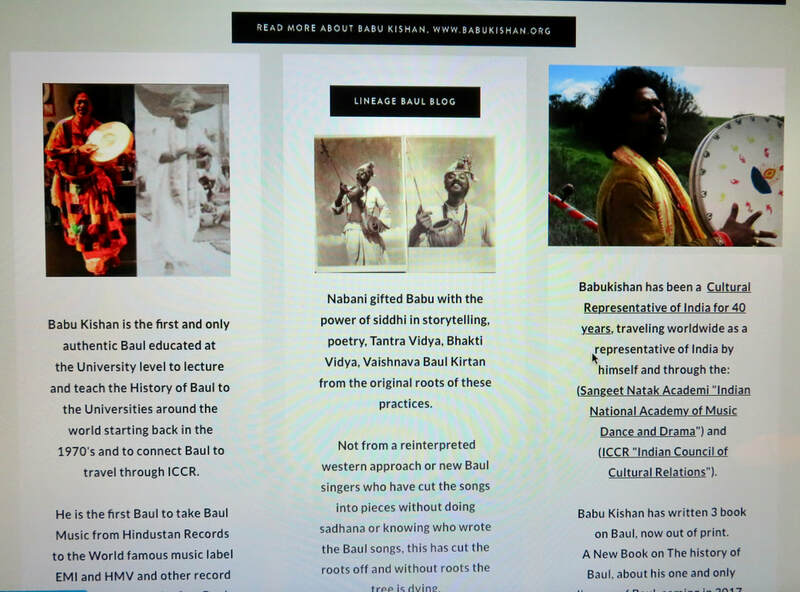 No one in this world would know know what or who Baul is without the work Babu Kishan or Babu who recorded all the Baul songs back in the 1970's along with his Father and Mother and Grandparents. Babu Kishan is a Vaishnava Baul, he is from the soul and soil of Bengal. Babu Kishan is a an accomplished award winning Music Composer of India and the only leading expert Scholarly and Musically on his Lineage of Baul and the Folk Music of India. He has worked as a consultant with all the Big Music Companies in Mumbai categorizing all of the Music of Folk Music of India, where it comes from and what type of Folk Music. He is a Folk Music Expert a Pandit of Folk Music. Born in Rural Suri Birbhum Bengal into the lap of his Grandfather Nabani Das Khyapa Baul, the Baul who initiated Rabindranath Tagore into Baul giving Tagore the name ' Ravi Baul'. Tagore appointed Nabani as the first and last Baul Song and Dance teacher at Tagore's University called Vishva Bharti. Nabani Das Khyapa Baul an Avadhuta Baul born in Ekachakra Bengal, he was well known, part of the Indian Freedom Movement. Jawaharlal Nehru the first Prime Minister of India appointed Nabani Das Khyapa Baul as a state singer in the Freedom Movement to sing before his speeches all over India, Nehru was smart because Baul have the power to draw large crowds of people. This became a tradition as Babu Kishan and his family did the same singing all over India on the biggest stages before Indira Gandhi and Rahul Gandhi before they gave their speeches all over India. Baul music draws all People together, Bauls are a symbol of Peace and through their singing magic happens and people come from far and wide. 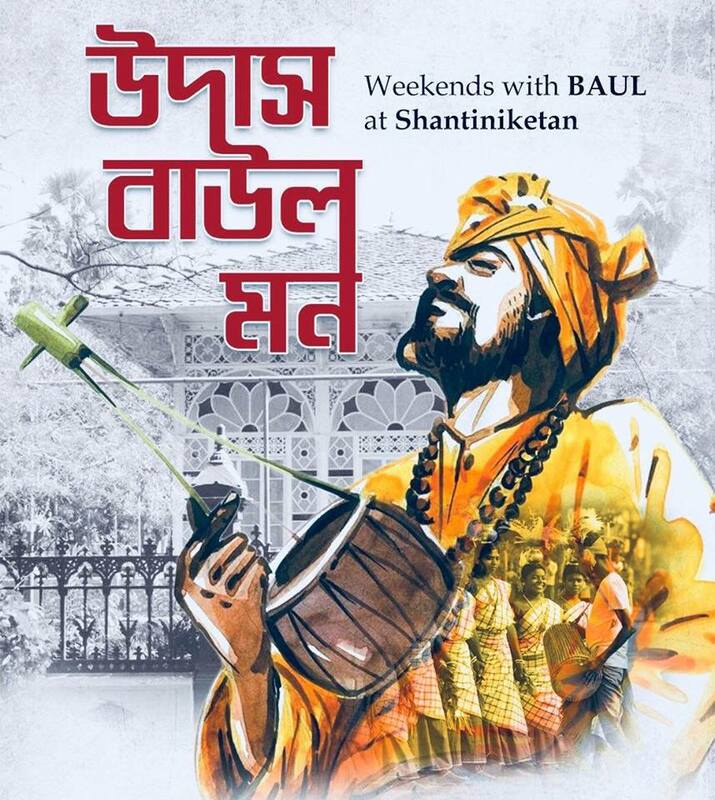 Today they Bauls are extinct and all we can do is uphold this tradition and keep the narrative accurate preserving the history of this One and Only Baul Lineage, this a beautiful folk tradition of rural Bengal the land called Rarh (the land of the red soil). ​Today Baul has been Culturally Appropriated by outsiders who have been flocking to Bengal from who knows where, Bangladesh and Assam even from outside of India, some sincere and some the 'fake it til you make it actors'? 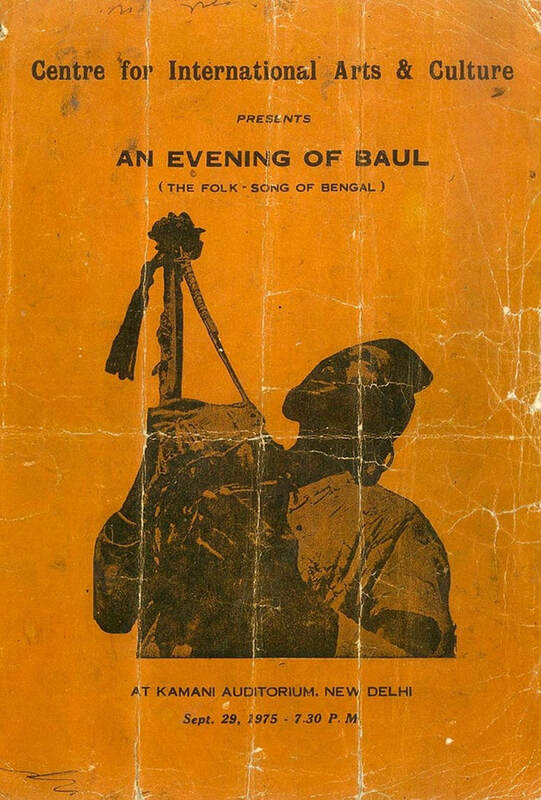 Baul has been culturally appropriated by the poor who need to make an income and they see freedom in following the success of Purna Das Baul they are try to be Purna Das Baul, Nabani Das Baul or Babu Kishan. Now new Baul singers are making up lineage and stories, taking our beautiful Bengali Poetry that Babu Kishan wrote or his family wrote and putting other poets names on. New Baul singers are culturally appropriating this lineage and their songs, Baul does not originate in Bangladesh this is a cultural appropriation because they take the stories and twist them for fundraising purposes. When you read Baul is associated with Bob Dylan or Allen Ginsberg, the only Bauls that were associated with Bob Dylan and Allen Ginsberg is Babu Kishan and this family. Cultural appropriation is when you take the names off and claim it as your own slowly deleting the original and saying it was you all along. Babu Kishan aka Krishnendu Das Baul is the one who helped bring Baul to the world,he started in the early 1970’s at a very young age. Composer of Folk Music, he composed all his father's Music from the 1970's to 2000. Not only did he compose the music, he produced it, arranged it and many times it was his own poetry. Composer of Indian Classical, Baul, Folk and Indian Cinema for 40 years. 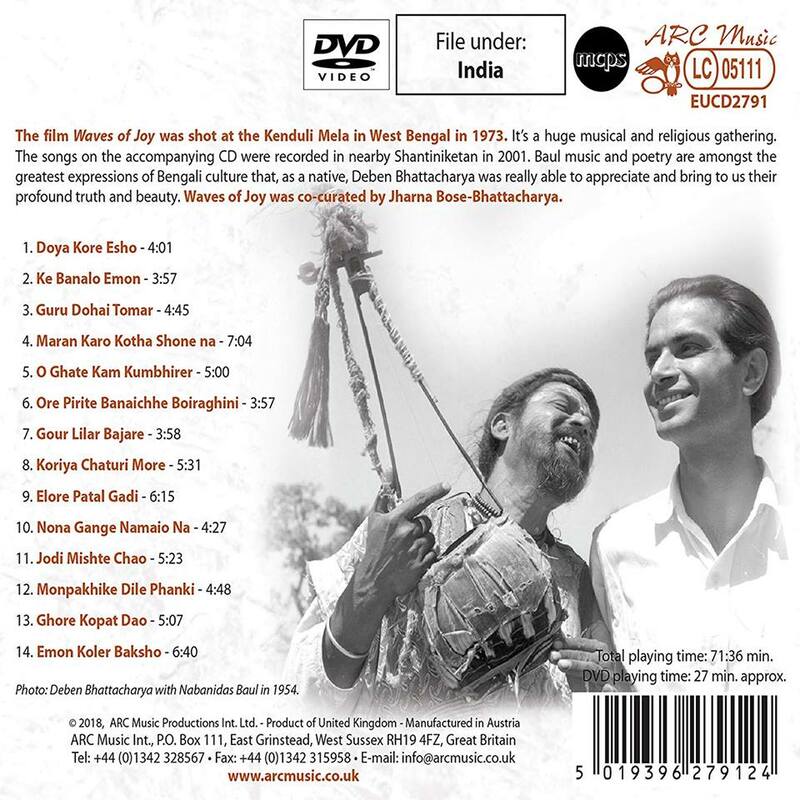 ​the top recorded Baul singer was Purna Das Baul. All the songs people are singing today come from these two singers and other sing exactly what they previously recorded, without giving their names, taking the names off and adding other names, this is cultural appropriation, it waters down and deletes the history of Bengal and India. Babu Kishan's Grandfather was initiated by Bama Khepa of Tarapith and was a well know Sadhaka at Tarapith, this is where Babu was brought when he was born premature and crooked limbs... he is also an initiate through his Grandfather of Tara Ma. ​This is Kirtan, this is the real Kirtan that Babu Kishan grew up with. Do you understand why Kirtan of the west is not Kirtan and why they call it chanting because real authentic Kirtan is not easy. Not many know this, however, many love Ananada Mayi Ma. Sitaram Das Omkarnath was very popular in Bengal he was a strict Vaishnava of the Ramanuja order and mostly wanted to be around men he would send all of the Women that would approach him to Ananda Mayi Ma. This is why whenever, one visits a ashram of Sitaram Das Omkarnath you will find a picture of him on one side and a picture of Maa on the other side of the entrance. Being Bengali Babu Kishan's family always had a special place at both SitaRam Das Omkarnath's side as he was one of Babu Kishan's fathers Guru and a Guru Bai to Babu Kishan's Grandfather Nabani Das Khyapa Baul. Babu's family would always sing at Anandamayi Ma's Ashrams, they were always chief guests. The woman name sitting down at Ma's feet is (Chhabi) Chobi Banerjee youtube video music below, when she started to sing Kirtan it was unheard of, at that time, that women were kirtan singers. In and around Benagal she is the 2nd woman to sing Kirtan as hard as that is to believe. I am sure in the homes privately there must have been other women who sang Kirtan as I know the Women Bauls sang Baul Kirtan but privately. I am thinking only a few sang openly but then again me with my western mental template is perhaps trying to qualify what Babu Kishan has told me back in 2010. I will have to ask him again. Chobi Banerjee was bestowed with the name Geetoshree, which means (Queen of kirtan.) . The first female singer to be noted was Radharani, they are both Bengali's before them no woman Kirtan singers were allowed to sing kirtan. Women just did not sing Kirtan it was a man's place? These 2 Women Chobi Banerjee and Radharani popularized kirtan for woman which allowed other women to come forth. They were very close family friends of Babukishan's family and very close to Anandamayi Ma. Anandamayi ma always gave a place for them to sing. Anandamayi was the guru of former prime minister Indira Gandhi, also Indira Gandhi was closely associated to Sri Nabani Das and Babu Kishan's family. Babu Kishan knew both Radharani Debi and Chabi (Chobi) Banerjee they both used to visit his house often. He grew up with the real authentic Kirtan and Bhakti Yoga and Authentic Vaishnava Sanskritist Baul which is so far from what Baul has become today.